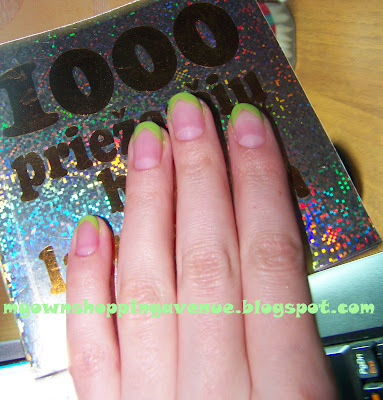 Naudotos priemonės: Frenchi Smart Enamel stipriklis, Essence žalias nagų lakas, Catrice top coat'as Last up to 10 days. I also love unexpected trips. On the spot. When you're planning to be at home all weekend but after 2-4hours find yourself in Jurmala (Latvia) or Kaunas... It doesn't matter where - it just matters wherewith. And I tottaly dislike one thing - totally sugarless :}} unexpected attack of health. It is very exhausting. If you are interested in feedback about my new shampoo - I really love it scent (just like totally fresh apples) but don't like effect. My hair can be described like "The mat of hair" :D so this shampoo don't make things easier - I have to try very hard to comb out my hair after washing with it... So I really wouldn't buy it for 20 litas (price without discount) and I'm a bit sorry about that 14 litas which I spend with discount. And also I'm showing you my first spring-like manicure. I'm not good at making french manicure so I was using stickers for that :) I was using Frenchi Smart enamel hardener, Essence green polish and Catrice top coat Last up to 10 days. P.S. I'm really sorry for my broken English but I think that only practice can make it stronger and better :) Hope that you understand that translation.